Nielson HomeScan has limited new openings for your opinions. Join the National Consumer Panel today! They give you a scanner and you scan your purchases each week and then electronically send them the information from your scanner. It’s an awesome opportunity to earn cash, and gift points which can be redeemed for Electronics, household items, toys and much more and you are giving your valuable opinion to help companies! Hurry over to sign up for Nielsen Digital Voice where you will get to take surveys and earn money from home! *HOT* Mobile Xpressions: FREE $5 Amazon Gift Card + More! UPDATE – A reader just got her TV that she won through this company!! LOTS of readers win this! Wow! There is an awesome program you can sign up for called Mob02ile Xpressions (if you are on an ANDROID GO HERE, IPHONE GO HERE or on an IPAD GO HERE)and you will get the minimum of a $5 Amazon gift card just for signing up! Everyone is guaranteed a prize when they sign up. You will also get rewarded for taking surveys with your phone or tablet. You can see in the photo below that one of my blogging friends readers actually won this fabulous TV from Mobile Xpressions and someone else won an iPad! Right now you may be able to get 100 FREE points when you enter code HAPPYKFREASTER2U at Kellogg’s Rewards! I have an AWESOME way for you to get super high value Kellogg’s coupons, toys, books and more for FREE with points, and you can very easily get FREE points (I will post them on Raining Hot Coupons). Also, you can get points from specially marked Kellogg’s packages. Points will be on things like cereal, snack foods and more! It kinda reminds me of My Coke Rewards or Pampers Gifts to Grow! Earn Money Taking Surveys From Home! Toluna (another great survey company that I like) has openings for survey takers as a way to earn money from home! Just go here to sign up. I have used this company for awhile and really like them, they seem to send a lot of surveys so that’s always good. I know a lot of readers that really like them as well. You can earn $1-$5 per survey which come as points and then redeemed later for checks. After you complete the Toluna registration, you will automatically be entered into the monthly $4,500 sweepstakes AND you will get 500 FREE points! *Remember, I will only talk about my favorite companies since there are so many out there. I also recommend signing up for all the good ones as a way to really maximize your earnings and this may mean having an email just for your survey companies. Start Saving for Christmas by Taking Survey with this HOT Company! There is a new way to earn money from home! 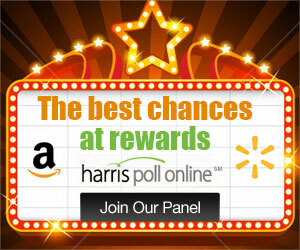 You can sign up for Harris Poll Online. Just be sure to check your email for a confirmation so you can start earning! You could even start saving up for next years Christmas now! I paid for my entire Christmas (and so did a LOT of readers) using Survey sites including this one!